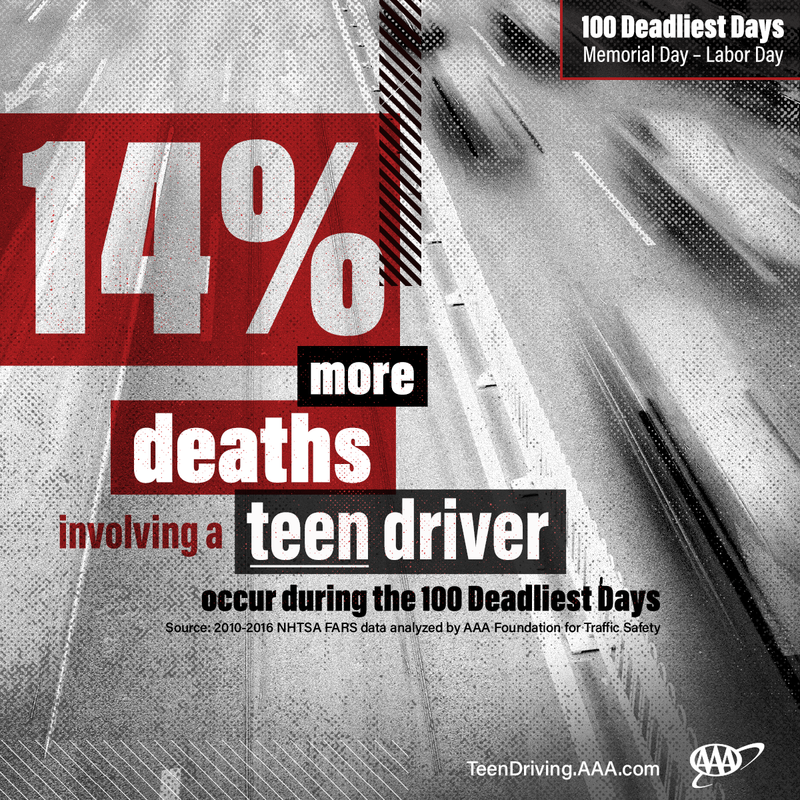 May 31, 2018 –More than 1,050 people were killed in crashes involving a teen driver in 2016 during the 100 Deadliest Days, the period between Memorial Day and Labor Day. That is an average of 10 people per day – a 14 percent increase compared to the rest of the year, according to data analyzed by the AAA Foundation for Traffic Safety. In Oklahoma, 3,486 crashes involving drivers ages 16 to 19 occurred during the summer of 2016. Eight teen drivers died and, in all, 20 people were killed. With school out for summer, AAA urges teen drivers to focus first on safety to avoid tragedy. 36 percent of all motor vehicle fatalities involving teen drivers occurred between 9:00 p.m. and 5:00 a.m.
TeenDriving.AAA.comhas a variety of tools, including licensing and state law information, to help prepare parents and teens for not only the dangerous summer driving season, but also all year long. The site also features new interactive widgets highlighting teen driving risks, as well as a social host quiz. The online AAAStartSmartprogram also offers great resources for parents on how to become effective in-car coaches as well as advice on how to manage their teen’s overall driving privileges. AAA provides automotive, travel, and insurance services to 58million members nationwide and more than 400,000 members in Oklahoma.AAA advocates for the safety and mobility of its members and has been committed to outstanding road service for more than 100 years. AAA is a non-stock, non-profit corporation working on behalf of motorists, who can now map a route, find local gas prices, discover discounts, book a hotel, and track their roadside assistance service with the AAA Mobile app (AAA.com/mobile) for iPhone, iPad and Android.For more information, visitwww.AAA.com. This communication (including all attachments) is intended solely for the use of the person(s) to whom it is addressed and should be treated as a confidential communication. If you are not the intended recipient, any use, distribution, printing, or copying of this email is strictly prohibited. If you received this email in error, please immediately delete it from your system and notify the originator. Your cooperation is appreciated.